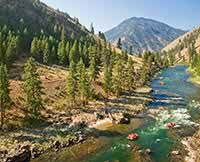 Western River Expeditions offers a comprehensive vacation package for you and the family as you travel to Idaho and down the great Salmon River. We offer 5 & 6 day Salmon River Rafting trips that feature many activities and things to see, like the excitement and challenge of the Middle Fork rapids – including the Velvet Falls, Pistol Creek and Devil’s tooth. Give us a call today (866) 904-1160 to reserve your vacation. Check out the free DVD for a glimpse of what we have to offer at Western River Expeditions. Still not convinced? Then check the over 1200 reviews we’ve received from past guests, and even watch video responses to get a clearer understanding of why you’d be missing out if you didn’t take advantage of some of these amazing vacation opportunities this season. Don’t forget to also check out the Western River Expeditions online clothing and gear catalog, for exclusive deals on clothing and gear for your expedition.